At first, I thought editing James Soriano’s infamous Manila Bulletin column should be enough. Yet after reading a lot of opinions about the issue, I think that there’s more to it than just a case of bad writing. It’s a case of bad perspective. Ludwig Wittgenstein writes that the limits of our language are the limits of our world. Let’s take that a step further: the social reality that is language, and the use of it, uncovers other social – and personal – realities. In a somewhat condescending tone (which may be attributed to the column being just a first draft), James refers to Tagalog as the “language of the streets:” one attributed to the tindera, the manong drayber, the katulong, the people who make a sheltered and privileged life possible. This isn’t a rant about the national language, though. On that note, James reveals the pink elephant in the room: the tindera, manong drayber, and katulong are people perfectly capable of learning English, given the right opportunities and means. Yet these are people who didn’t have the privilege of a private school education. They didn’t have mothers who bought flash cards to teach them the English alphabet. They didn’t have the English-dubbed cartoons for entertainment on a Sunday afternoon. They didn’t have private tutors to teach them the basics of the language. It’s often the case that they learned the basics from decrepit, overcrowded classrooms, punctuated with the lack of books, threadbare uniforms, and the many breakfasts they skipped to get schooling. Underscored by teachers and educational instititutions that lack motivation or resources. Is English the language of privilege? When we lend a perspective beyond pride in one’s own cultural artefacts, to learn and use English is a privilege in a condition marked by social inequalities, economic inequities, and human injustice. Yes, it is a language of privilege, and of the privileged. It is a means to get other privileges, like a career where “excellent communication skills” (read: English) are a key to success. 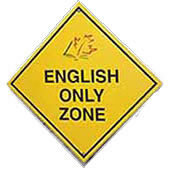 People privileged enough to get an education that emphasizes English get the privilege of learning English, which in turn leads to a privileged life. The same is true with so many other things; like robotics, elementary Latin, religion, advanced mathematics. We cannot divorce the way we are educated – formally or informally – from our economic standing and our social capabilities. Rather than become a key to success, education – especially public education – becomes a way to reaffirm the status quo. Education may be the way out from poverty and deprivation, but if the education system is itself poor and deprived, then it does nothing to foster the thirst for knowledge, much less how adept one is with another language. The rich boy has all the opportunities to become richer because of the advanced computer classes in his school and the English-only policy in its corridors. The poor boy has all the chances to stay poor because he can’t afford to pay for the rich boy’s tuition, instead learning English from underpaid schoolteachers, or learning its halting forms in the streets if he’s not in school. Through no fault of his own, may I add: the lack of investment in basic education on the public, national level makes it so. It is that lack of investment that reflects itself in so many aspects of society: employment, politics, the banalities of everyday existence. It is not an issue of what the national language is, but how language is used in the nation. Which brings me to a very important point: education, the Great Equalizer of all opportunities for people to succeed, is not immune from the distinctions and realities of social and economic class. In fact, education can even be a weapon or a tool to keep things the way they are, instead of improving the lot of people in the world. In his self-deprecating (?) way, James Soriano pinned it right then and there: the fact that he is not the son of a tindera or a manong drayber or a katulong – and enjoys the services of those beneath him in the social system – establishes the fact that he, indeed, speaks the language of the privileged, the wealthy, and the learned by virtue of privilege and wealth. Privilege, wealth, and learning in their most material, perceptible forms: money, resources, social capital, and yes, warsh-warsh English. Which makes him representative of the sentiments of that top tier of society that uses language – among other things – to reinforce the status quo, to affirm oppression, to doom the poor to a state of poverty simply because of the way they talk. It’s not syntax, semantics, or structure that lends value to a system of language. Rather, it is the way this language is used in society. Many of the stupidest, most idiotic ideas find a perfect means of expression in the English language. If anything it is the use of language as a weapon for oppression that James Soriano hints at. And in the process, reveals his presence on that side of the equation. The side that Other-s the tindera, the manong drayber, and the katulong to that condition because of the way they talk. There is an expression in Filipino: mata-pobre. Connect the dots. Great insight as always, Marocharim. 😀 Ah, education. I read somewhere that education used to get one third of the national budget, up until around the Strong Man’s time. Now what do you think about his ‘comeback’ piece? Haha. Nag-effort pa siyang mag-Filipino. I don’t agree, I think James Soriano is simply being honest and we Filipinos just can’t handle that truth. If he was Mata-pobre then so be it but always at the expense of himself and not of other people not of his language nor of his upbringing let it be him as we realize how our society has made a person out of him.